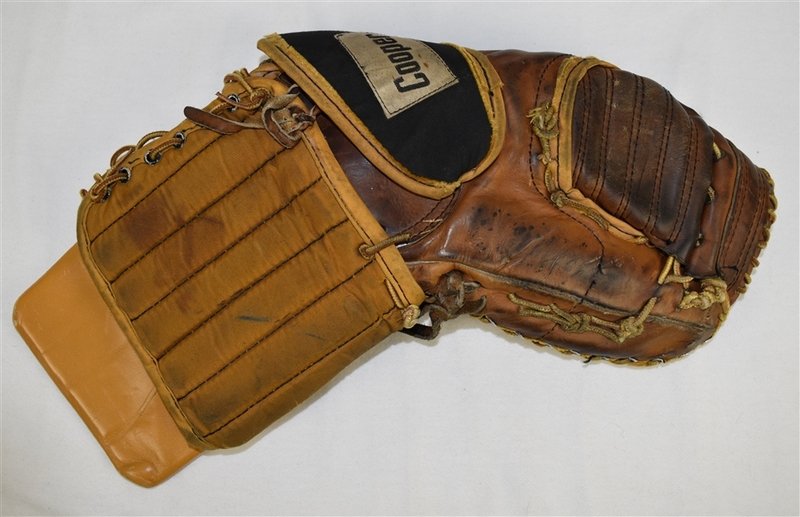 This vintage Cooper made goalie glove was worn by Jim Craig in the late 1970’s during his collegiate career at Bostun University. Craig spent 3 years playing goal for Boston University where, in 1979, he was a 1st team NCAA East All Star and a 1st Team ECAC All Star. 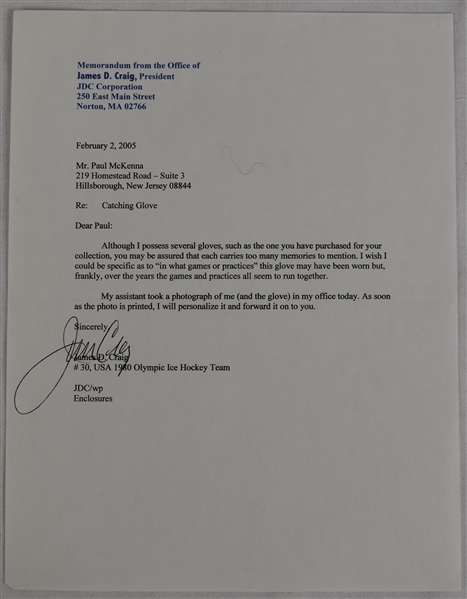 Jim then made the decision to join Team USA, and what a great decision it turned out to be. He played in the 1979 World Championships and then became the man between the pipes for the U.S. National Team in 1979-80, playing in 48 games. Naming Craig to the 1980 Olympic Team was an easy decision for Coach Herb Brooks. This North Easton, Massachusetts native then proceeded to deliver one heroic performance after another as Team USA pulled off the “Miracle On Ice” and brought home the Gold Medal at the 1980 Winter Olympics in Lake Placid. 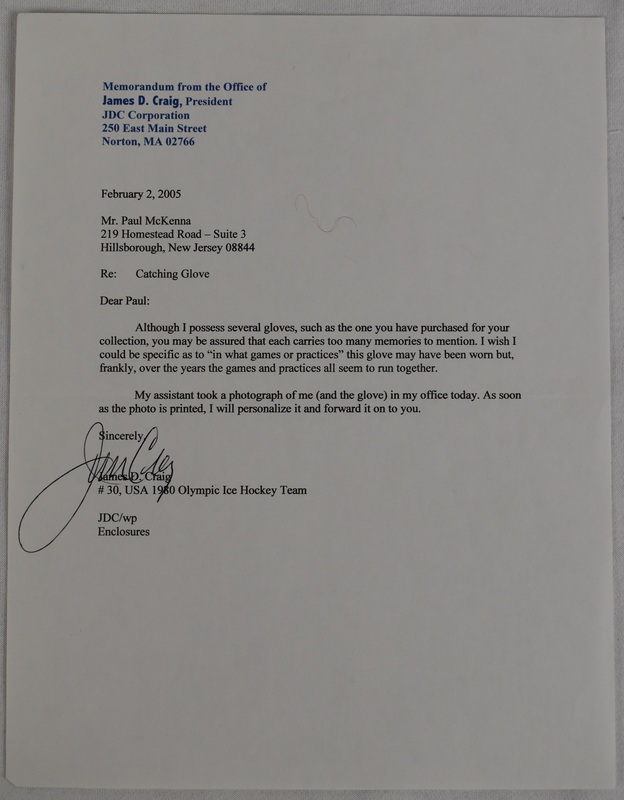 Jim went undefeated, going 6-0-1 in his 7 Olympic starts and posted a 2.14 GAA, while producing a series of memories that will live on forever in the hearts and minds of hockey fans! Following the 1980 Olympics, Craig joined the Atlanta Flames who had drafted him in the 4th round of the 1977 NHL Amateur Draft. Jim spent the remainder of that season in Atlanta and was dealt to his hometown Boston Bruins that summer. Craig shared the goaltending duties in 1980-81 with Rogie Vachon, playing in 23 games and posting only 7 losses in 22 decisions. Craig lost his backup role to Marco Baron the following year and found himself in the minors playing for Erie. The following year, Jim returned “home” to the U.S. National Team and posted a couple of shutouts and a 2.64 GAA in 26 games. Jim again rose to the occasion and was named to the 1983 World Championship All Star Team while also being named goaltender of that 1983 IIHF tournament. The 1983-84 season was the last of Craig’s playing career. After seeing his exploits at the World’s, the Minnesota North Stars offered Craig a Free Agent contract. Jim appeared in 3 games for the Stars while spending the majority of the year with the Salt Lake Golden Eagles. 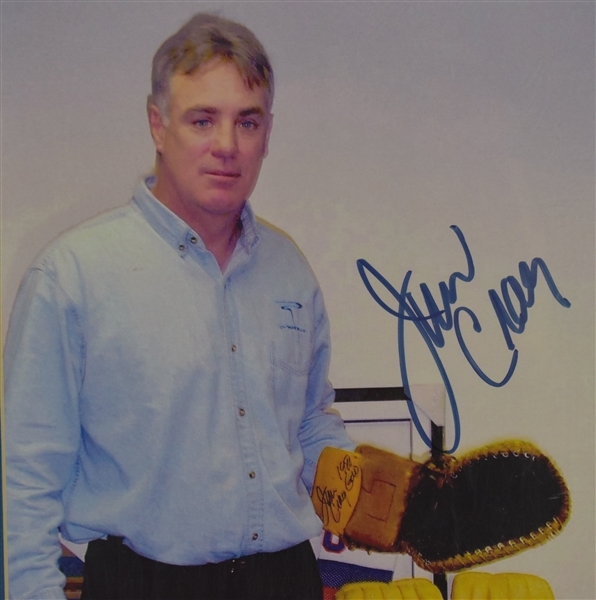 Craig is a deserving member of the IIHF Hall of Fame, having been elected in 1999. Offered here is Craig’s goalie glove from his days at Boston University. This vintage Cooper made glove shows terrific game use and features Craig’s autograph with the further notation 1980 Gold on the extender pad. 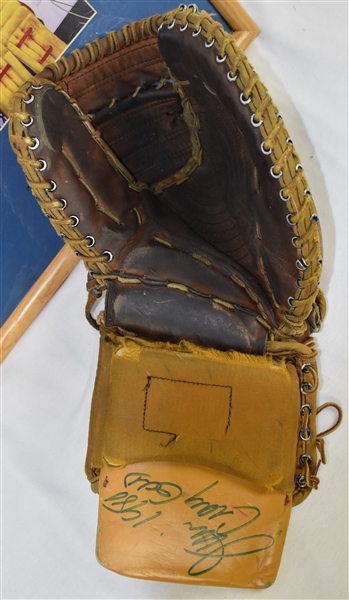 Shown above is a yearbook photo taken of Craig in game action during the 1976-77 ECAC season, wearing what could be this goalie glove. This was Craig’s first year at Boston University! 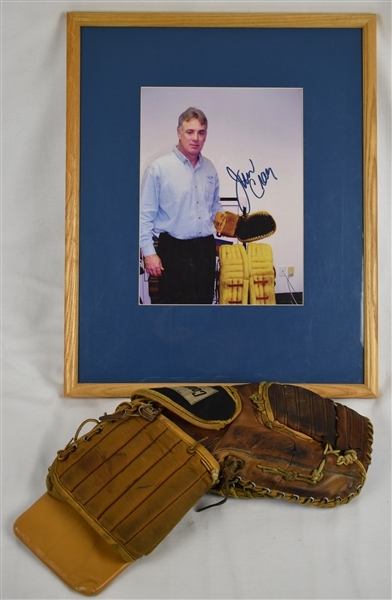 Also included with your purchase will be a beautifully framed and autographed 2005 photo of Craig trying on his old goalie glove. 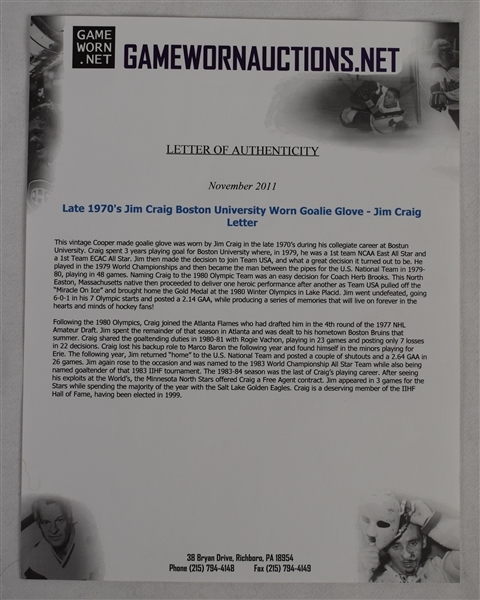 Furthermore, a letter from and signed by Craig discussing this glove will also accompany your purchase. The images of Jim, the draped American Flag and the search for his Dad in the stands after Team USA defeated the invincible Russian team are ingrained in our memories and will live on with us forever. The opportunity to acquire a game worn item from Craig’s all too brief career is indeed rare. 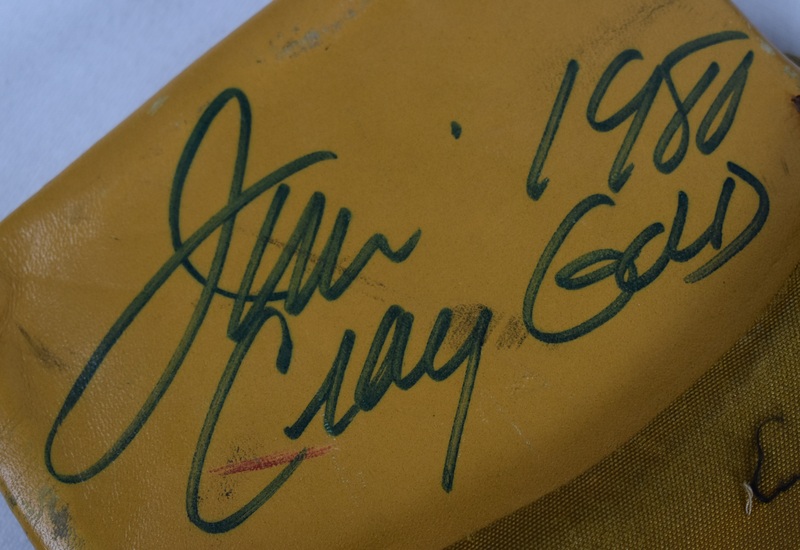 This spectacular trapper, worn during his collegiate days and recently autographed by our Olympic Hero, is an opportunity that should draw the attention of the goalie and 1980 Olympic collectors alike, choice!